29 cm 208 p. : col. ill.
Two hundred years ago, the Brothers Grimm published their famous collection of folk tales, including these thirty much-loved stories of helpful elves; giants who can see into the next land; foolish but good-hearted lads; princesses with golden hair; faithful servants and wicked queens. 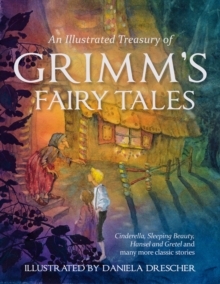 This sumptuously illustrated collection of essential Grimm classics includes stories every childhood needs: 'The Princess and the Frog', 'Little Red Riding Hood', 'Sleeping Beauty', 'Cinderella', 'Rumpelstiltskin' and dozens more. Each tale is brought to life with radiant, faithful pictures from Daniela Drescher, one of Germany's best-loved illustrators, which are sure to fire any child's imagination.